Reno, Nevada has long thrived on the aspirations of visitors and residents alike. From a popular waypoint during the California Gold Rush, to today’s gambling destination, the city draws those seeking their fortune. Although it is three times smaller than Las Vegas, Reno is the largest city in northern Nevada and has its own unique attractions that bring in plenty of tourists every year. While Reno is one of the US’s centers of enjoyment and entertainment, it has also fallen victim to high rates of substance abuse like many places across the country. Prescription drug abuse, particularly opioid addiction, is a large problem in Reno and the rest of Nevada; other intoxicating substances, like alcohol, marijuana, and cocaine, also cause serious harm to the community. In 2011, methamphetamines and amphetamines were the drug of choice for 44 percent fewer admissions than in 2007, declining from 4,402 to 2,446. Heroin was the drug of choice in 104 percent more admissions in 2011 than in 2007, increasing from 564 to 1,148. Other opioids were the drugs of choice in 112 percent more admissions in 2011 than in 2007, increasing from 346 to 734. Lastly, benzodiazepines were the drug of choice for 341 percent more admissions in 2011 than in 2007, increasing from 17 to 75. According to a 2013 report, accidental deaths involving either prescription drugs, alcohol, or both have increased 700 percent among people over the age of 60. In 2015, the Nevada Youth Risk Behavior Survey (YRBS) found that 17.0 percent of the state’s surveyed high school students had taken a prescription drug (such as opioids, stimulants, or benzodiazepines) without a prescription at least once in their life. In Washoe County, where many students live in Reno, that percentage increased to 18.3 percent. 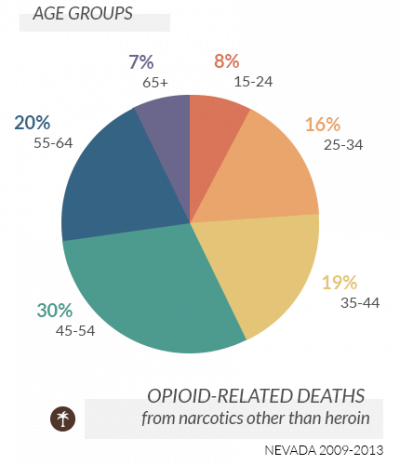 Every day, over 46 people in the US die from prescription opioid-related overdoses. The opioid abuse epidemic has become a major problem in the United States. Every day, over 46 people in the US die from prescription opioid-related overdoses, according to the Centers for Disease Control and Prevention (CDC). Methadone, oxycodone, and hydrocodone are the most commonly involved drugs in prescription opioid overdoses. Over 40 percent of opioid overdose deaths in the US are due to a prescription opioid. 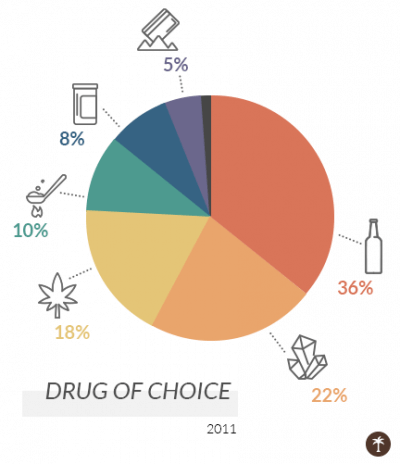 According to a 2014 report by the Substance Abuse and Mental Health Services Administration (SAMHSA), among Americans over the age of 11 reporting past month illegal drug use, nonmedical use of prescription pain medications was second only to marijuana, which many states are making legal for recreational or medical purposes, in terms of rates of use. According to the National Governors Association, a 2013 Behavioral Risk Factor Surveillance Survey found that Washoe County residents, who primarily live in Reno, are more likely than other Nevada residents to use a pain medication to get high. Among college students surveyed at the University of Nevada, Reno (UNR), 11 percent in 2012 stated that they had consumed an opioid analgesic (OxyContin, Vicodin, or Codeine) not prescribed to them; this was higher compared to the US average of 7.5 percent. There were 4,539 emergency room visits in Nevada in 2013 due to heroin or opioid abuse, dependence, or poisoning. Prescription narcotics abuse is still very high in Nevada, but according to a Reno Police sergeant interviewed in 2013 news article, meth and heroin were the most commonly used drugs in Reno at that time. Reportedly, most crimes of burglary, fraud, and stolen identity were committed by people struggling with substance abuse and addiction as they tried to fund their drug purchases. Alongside heroin, meth is one of the most abused drugs in the city of Reno, according to a Reno Police sergeant. Methamphetamine is one of the main contributors to overdose deaths in Nevada, with about 228 Nevada residents dying in 2016 from overdoses involving psychostimulants according to the CDC. Thus, Nevada’s rate in 2016 was 7.5 psychostimulant-related overdose deaths per 100,000 Nevada residents, the highest rate out of the 31 states (and Washington, D.C.) for which the CDC had data. According to a 2015 report, the trafficking and use of Mexican methamphetamine is prevalent in Nevada and thought to be still growing. While the intoxicating beverage is legal for consumption among adults 21 years old and older in the US, excessive and unsafe alcohol use continues to be a huge problem, leading to accidental death, chronic health problems, and risky behaviors. The National Institute on Alcohol Abuse and Alcoholism (NIAAA) reported that, in 2015, about 15 million adults across the country suffered from alcohol use disorder, as well as an estimated 623,000 adolescents. Based on 2015-2016 surveys, in Nevada alone an estimated 124,000 adults (about 5.6 percent of that population) and an estimated 6,000 12- to 17-year-olds (about 2.6 percent of that population) suffer from an alcohol use disorder. None of these aforementioned numbers include the millions of Americans who drink heavily and/or binge drink but do not meet criteria for an alcohol use disorder. Yet, heavy drinking and binge drinking both still increase risk for long-term health problems and other negative consequences. One in six American adults binge drinks around four times per month, according to the CDC. Binge drinking is defined as a drinking pattern that elevates an individual’s blood alcohol concentration to 0.08% or more, which generally happens when women consume 4 alcoholic drinks or more in 2 hours or when men consume 5 alcoholic drinks or more in 2 hours. Based on 2015-2016 surveys, where binge drinking is defined as men consuming five or more drinks in 2 hours and women consuming 4 or more drinks in 2 hours, an estimated 584,000 adults had binge drank in the past month, which is about 26.5 percent of that population. An approximated 15,000 adolescents had binge drank in the past month, which is about 6.6 percent of that population. One of the leading problems with consuming too much alcohol is fatal car crashes. One of the leading problems with consuming too much alcohol is fatal car crashes. In 2015, Nevada had 97 people die in alcohol-related car accidents. Although nationally alcohol-related car accident fatalities have gone down 64 percent since 1982, in recent years Nevada has seen a slight increase in their alcohol-related car accident fatalities: 81 deaths in 2013, 93 deaths in 2014, and 97 deaths in 2015. Child endangerment is another problem with excessive alcohol use, whether due to an alcohol use disorder, heavy alcohol consumption, or binge drinking. According to a 2015 survey, about 22.1 percent of high school students in Washoe County had, in the past 30 days, been in a vehicle with a driver who had been drinking. This could include drivers who were friends, parents, guardians, siblings, or others. This is similar to the overall Nevada rate of about 21.4 percent of high schoolers. According to a 2016 report, individuals under the legal drinking age (under age 21) were able to obtain alcohol at 18 percent of establishments in the downtown Reno area, which is equal to approximately one in five alcohol-licensed establishments. In 2015, 65.6 percent of surveyed high school students in Washoe County reported they had at least one alcoholic drink in their life, which was only slightly higher than the statewide average of 64.0 percent. In Washoe County, 35.5 percent of surveyed high schoolers were current drinkers, defined as having at least one alcoholic drink within the 30 days before being surveyed. Statewide, this rate was 30.6 percent in 2015, a decrease from the 2013 rate of 33.3 percent. Among Washoe County high school students polled, 19.3 percent binge drank (defined as drinking five or more drinks within a couple hours) within 30 days before being surveyed. This was about 26 percent more than the statewide average of 15.3 percent. According to SAMHSA 2015-2016 surveys, about 21 percent of Nevada adolescents between the ages of 12 and 20 had consumed alcohol in the past month, which equals an estimated 70,000 adolescents statewide. Furthermore, about 12 percent of the same age group in Nevada (an estimated 40,000 12- to 20-year-olds) binge drank alcohol in the past month, with binge drinking here defined as 4 or more drinks for women within 2 hours and 5 or more drinks for men in 2 hours. As of January 1, 2017, adults aged 21 and older can buy, possess, or consume marijuana recreationally. 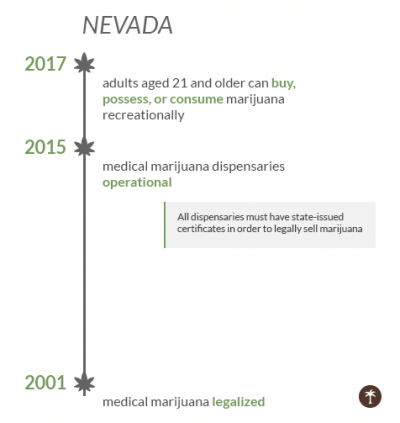 Medical marijuana has been legal in Nevada since 2001, and medical marijuana dispensaries have been operational in the state since 2015. All dispensaries must have state-issued certificates in order to legally sell marijuana, and there are separate licenses for medical marijuana and retail. As of March 9, 2018, Washoe County has eleven dispensaries that are licensed to sell marijuana for adult use, including four in Reno (larger Clark County, home to Las Vegas, has 43 adult-use marijuana dispensaries). Although the state has made it legal for anyone aged 21 and over to purchase and consume the drug, it is still illegal to drive under the influence of marijuana, just like it is illegal to drive under the influence of alcohol. It is also illegal to use marijuana in any public place or in a moving vehicle (even for passengers), and it is still illegal for anyone under the age of 21 to consume marijuana products. According to 2015 surveys, 45.2 percent of surveyed Washoe County high school students had ever used marijuana, which is higher that the statewide average of 39.4 percent. Furthermore, 24.6 percent report using marijuana currently (defined as use within 30 days before being surveyed), which is about 25 percent more than the statewide average of 19.6 percent. With marijuana being an accepted and legal recreational substance in Nevada, high school students likely have increased access through older friends or relatives and thus are more likely to try this dangerous drug. In a 2015-2017 community health needs assessment of Washoe County, researchers found that the area suffered from a shortage of mental health providers. Furthermore, most surrounding counties also have mental health provider shortages, so the limited providers in Reno are even more overburdened. This is especially concerning as the area has higher suicide rates than both Nevada and the US overall. Additionally, high schoolers in the county report higher rates of feeling sad/hopeless than elsewhere in the nation, and about 14 percent of high schoolers in the county report a history of suicide attempts, almost double the national rate. Mental health problems are especially prevalent among incarcerated individuals in Washoe County. In the Washoe County jail, about 61 percent of the male inmates in 2011 reported a history of mental illness. Almost 65 percent of those served in Washoe County mental health court were homeless, and about 85 percent had a substance use disorder co-occurring with their mental health condition. 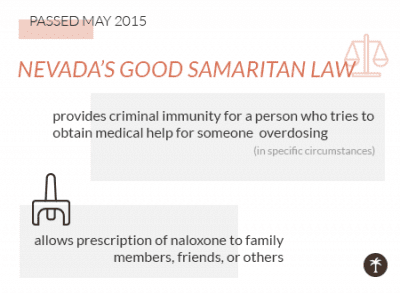 While drug possession, drug use, and drunk/drugged driving are punished harshly in Nevada, the state has a Good Samaritan law which provides criminal and other immunity for a person who tries to obtain medical help for someone (themselves or someone else) suffering from a drug or alcohol overdose, in specific circumstances. This law, SB 459, was passed in May 2015. It also allows prescription of naloxone to not only people at risk of opioid overdoses, but also to family members, friends, or others who are situated to help a person at risk of overdosing on opioids. As of July 1, 2016, and for the following 10 years, Nevada is working to develop and implement a comprehensive plan for substance abuse programs and will certify providers, facilities, and programs based on the developed standards. The Substance Abuse Prevention and Treatment Agency (SAPTA) is a part of Nevada’s Bureau of Behavioral Health and Wellness Prevention. SAPTA’s primary functions are to distribute funds, develop and implement substance abuse service plans for the state, and devise certification standards for services and programs. Some of its 2018 objectives include decreasing service gaps, increasing the utilization of evidence-based practices, improving timely and appropriate access to care, and increasing the workforce’s competency. According to a 2018 report, Nevada’s overall ranking for mental health was the worst among the US states and District of Columbia. This ranking focused on prevalence of mental illness and access to care, but it included 15 specific measures. Nevada was ranked second worst for overall adult ranking and worst for overall youth ranking. Nevada ranked 9th worst for prevalence of mental illness and 5th worst for access to care. About 66 percent of Nevada adults with mental illness did not receive treatment for their mental illness, which equates to about 268,000 Nevada residents and is notably higher than the national average of about 55.8 percent. 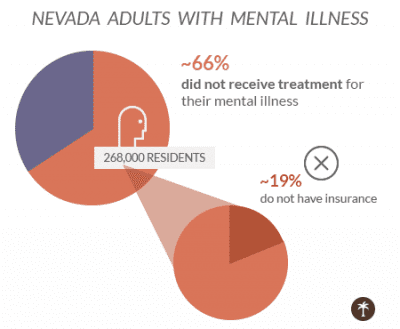 Approximately 19 percent of people with mental illness in Nevada do not have insurance. Reno created a Misdemeanor Co-Occurring Mental Health and Substance Abuse Disorder Specialty Court in 2011 to help defendants suffering from substance abuse combined with mental illness. Rather than incarcerating those suffering from these conditions, the court provides an alternative program of treatment, thereby addressing the root causes while still holding offenders accountable for their actions. Because many of those going through the court system are disadvantaged, low-income, or transient, the court provides mental and behavioral health services at no cost, including screening, assessment, case management, outpatient services, probation monitoring, and medication monitoring. According to a 2014 report, the programs are effective: of program graduates, 85 percent had not reoffended, and clients demonstrated a great improvement in mental illness symptoms, in abstinence from substances, and in employment success. According to a 2017 situational analysis by SAPTA, there are 13 certified coalitions working to prevent substance abuse. Most are located in 1 to 3 counties, but there are two that are statewide. SAPTA also funds 51 prevention programs across Nevada. There are over 100 certified treatment programs in Nevada, and about 40 percent of them received funding from SAPTA. In May 2014, new prescription monitoring software was implemented by the Nevada Board of Pharmacy. This new system connects the state’s prescription monitoring program with those of 24 other states, enabling providers to better identify potential misuse or abuse of prescriptions since they can access a more thorough history of a patient’s controlled substance prescriptions. The Division of Parole and Probation keeps a list of licensed substance abuse treatment facilities, licensed transitional living facilities, licensed halfway houses, and other resources based on information gathered from the Nevada State Health Division. This enables them to help those who are on parole or probation and have substance use disorders to find treatment. Veterans living in Reno, Nevada, can utilize the VA Sierra Nevada Health Care System, located in Reno. The facility provides a substance use disorder intensive outpatient program as well as a standard outpatient program for substance use disorders. They also have an outpatient PTSD clinical team and a homeless veterans program. Psychology Today provides listings of many treatment centers for substance abuse and mental illness in Reno, NV. Selections can be narrowed down by outpatient or residential options, accepted types of insurance, and much more. The Internet Chamber of Commerce (ICC) also provides a list of drug abuse treatment options in Reno. Join Together Northern Nevada (JTNN) is a coalition that works to bring individuals and groups together to identify, evaluate, and create plans to address substance abuse problems in Washoe County. This assistance includes a non-emergency substance abuse helpline that is free and confidential. The helpline is staffed 24 hours a day by substance abuse professionals. JTNN also provides a prescription drug disposal program twice yearly in several locations; a list of evaluation centers, outpatient treatment centers, detoxification centers, residential treatment centers, and more; a library; online informative resources; and training opportunities. The Nevada Prevention Resource Center (NPRC), operated through the University of Nevada, Reno, has served the community since 1998. The NPRC has been funded and certified by SAPTA since then. The main focus of the organization is to share accurate information and resources about the prevention and treatment of substance use disorders and recovery. The National Organization on Fetal Alcohol Syndrome (NOFAS) provides a list of diagnosis, prevention, and treatment options specifically for pregnant women and affected children in Nevada. The mission of NOFAS is to prevent prenatal exposure to substances and to support those with Fetal Alcohol Spectrum Disorders (and other preventable developmental disabilities) and their families and communities. For those in need, the Reno-Sparks Gospel Mission provides free substance abuse treatment services, as well as emergency clothing and hygiene products, emergency shelter, free meals and emergency food assistances, clothing vouchers, and referrals to social service agencies. Their treatment program, the Christian Addiction Recovery and Education program (C.A.R.E. ), is a residential program with a holistic approach that strives to address all their clients’ needs, with a Christian mission. Unlike other free treatment options that may end after one or two months, C.A.R.E. provides help for 13 months. Although many people in Reno, Nevada have struggles with opioids, alcohol, and other drugs, the state is working hard, in conjunction with the rest of the country, to address these issues and get residents the help they need. There are many options available for residents, including government assistance and nonprofit help with or without a spiritual bent.